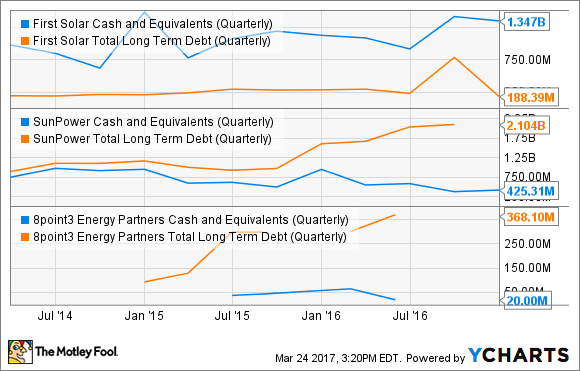 3 Beaten-Up Solar Stocks: Are They Bargains? Shares of First Solar, Inc., SunPower Corporation, and 8Point3 Energy Partners LP are all down between 39% and 85% from recent highs. Here's why they may be worth buying right now -- and here's what you need to understand before you do. If you've bought shares of First Solar, Inc. (NASDAQ:FSLR), SunPower Corporation (NASDAQ:SPWR), or 8Point3 Energy Partners LP (NASDAQ:CAFD) over the past three years, you've almost certainly seen your investment lose value. Much of the beating these stocks have taken has been deserved, with profits and revenue declining under weak cyclical demand. Factor in expectations that a return to growth isn't expected to happen in the next year or more, and there's a good chance the market will continue to look favorably on these major players in the solar industry. Nonetheless, there's also a case to be made that even if "bargain" is a strong word, all three of these investments are still worth considering right now. Let's take a closer look at why that's the case. Let's start with the big, long-term picture. The solar industry has grown at an enormous rate over the past couple of decades, yet it still makes up a tiny portion of global electricity production. Between technology advances and cost reductions in recent years, solar has achieved cost parity with traditional fossil fuels in many global markets, setting it up for years of faster-than-industry growth. But if history is any lesson, that growth won't just be steady and regular, with a significant demand coming from major utility-scale projects, which can take years to plan and are budgeted for well in advance. And it's looking like right now is one of the periods when demand will be down. Cyclical weakness in utility-scale solar is offsetting residential growth. Image source: Getty Images. First Solar and SunPower are major players in manufacturing components for and building utility-scale solar projects, and far fewer of these projects are lined up for construction in North America right now. Without getting too deep in the weeds, the short version is that both companies must work to reduce expenses while demand is weaker yet still have the capacity in place to respond quickly when demand picks back up. This carries over to 8Point3 Energy Partners, the master limited partnership sponsored by both companies, which acquires solar assets from them and makes money from the cash flows they generate from the sale of electricity. With fewer of these projects lined up for construction, this MLP's near-term growth prospects may not seem as bright as they were when it was first taken public. Both SunPower and First Solar are already actively working to position their operations for the next surge in solar investment. First Solar has made the decision to skip an entire iteration of its solar panels and instead invest its resources in having an even more advanced, efficient panel in production when the current downcycle ends. When management spoke to analysts after earnings in February, CEO Mark Widmar said that the company was already well on its way toward shutting down many of its current Series 4 manufacturing lines in an effort to reduce expenses and capacity to match demand, as well as to begin implementing pilot manufacturing of its Series 6 panels by early 2018. SunPower, too, is working to mitigate the weakness in utility-scale solar while still maintaining its ability to grow sales in the residential and commercial markets, which have remained relatively healthy, and where the company is one of the biggest in North America. The company has largely completed steps to reduce manufacturing capacity to lower expenses while also making progress to reallocate capacity toward its lower-cost P-Series panels. 8Point3 remains an important part of the capital strategy for both companies, as they will utilize it to shift major projects off their balance sheets and instead take a small share of the cash flows (paid in distributions from their investments in the MLP). This could be especially beneficial while utility-scale orders are down, freeing up capital resources and helping keep debt levels -- and interest expenses -- lower than they would be otherwise. This is especially important during a downturn, when there's a higher risk of cash outflows exceeding inflows at times. First Solar is in an excellent position to ride out the current cycle, carrying more than $1 billion in cash on its balance sheet with very little debt. Furthermore, management expects to generate plenty of free cash flow over the next year and projects it will end the year with $1.4 billion or more of net cash on hand. SunPower, on the other hand, carries significantly more debt ($2.1 billion) and far less cash ($425 million) than First Solar. But it's important to understand the nature of SunPower's debt, with much of it non-recourse to the company but collateralized by individual solar projects, which the company will sell once completed. FSLR Cash and Equivalents (Quarterly) data by YCharts. And 8Point3 will be the buyer of some of those projects, meaning that SunPower will not only be able to monetize those projects after completion -- generating some profit and using the proceeds to reduce its debt -- but will also pay down the debt associated with those projects. 8Point3's margin of safety is in its assets, which are under long-term agreements to sell the electricity produced. In other words, it's a lot like a utility, with fixed costs to maintain its solar assets and agreements in place to sell the power they generate. This should lead to steady, predictable cash flows that are unaffected by market demand for new projects. 2017 isn't going to be a great year for SunPower or First Solar, with both companies heavily exposed to utility-scale solar. But even with that reality, both companies are trading below the book value of their assets. For income investors, 8Point3's current dividend yield of over 7% is incredibly safe -- and a very real value in this yield-starved environment. First Solar and SunPower remain two of the biggest and best panel manufacturers in the industry, and 8Point3 is positioned to generate strong capital returns for investors while also giving its two sponsors more operational flexibility. It may take a little time to play out, but buying any of these three -- and holding them through the downcycle -- is likely to work out very well for patient investors.